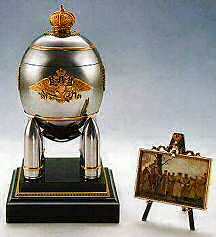 The 1916 Steel Military Egg, also known as Steel Egg with Miniature Easel, is made of gold, steel, jade white enamel, silk and velvet. 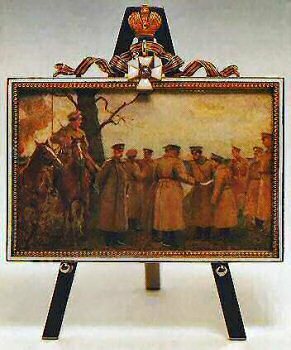 The miniature easel i s made of steel gold, opaque black, orange and white enamel, and watercolor on ivory. The base is made of gold, steel and nephrite. The steel Egg, with gold patterns surmounted by a gold crown, rests on four artillery shells. It is divided into three sections by two smooth horizontal lines. 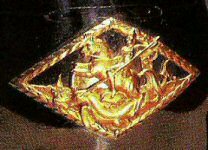 In the middle section, in invalid gold, is an image of George the Conqueror in a diamond-shaped frame outlined in laurel leaves; the date "1916" encircled by a laurel wreath; the Russian emblem, consisting of a double-headed eagle beneath three crowns; and the monogram of empress Alexandra Feodorovna, also encircled by a laurel wreath. 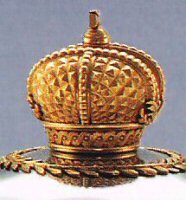 The Egg is surmounted by a golden crown surrounded by a gold wreath. The four steel artillery shells supporting the Egg are set on a dual-level square nephrite base. A steel easel bearing the monogram of empress Alexandra Feodorovna is inserted into the egg. On the easel there is a gold and white enamel frame displaying the emblem Order of St .George surmounted by a golden crown. The frame encloses a miniature painting on ivory by Vassily Zuiev depicting Emperor Nicholas II and his son at the Front. This was the year that Fabergé had to close his workshops because all his craftsman were at the front. It was impossible for him to create any works of art. There were no materials, as gold and silver were forbidden for jewelers to work with. So he had to use steel and copper. On the other hand it seemed inappropriate when the Imperial family was noticed to buy expensive works of art while the country and its people were bleeding because of the war. The story goes that in 1916, when Nicholas II was far from home at the front, he sent a telegram to Fabergé asking him to deliver that years Egg to the Tsarina at Tsarskoye Selo. On Easter eve Eugène Fabergé acted for the very last time in father's name. He was received by the Tsarina and her five children and gave to her what must have been one of the most simple objects ever made by Fabergé for the Imperial Family; an egg, made of black steel with the initials of the Tsarina in gold. Alexandra sent a telegram to Nicholas II at the front, which reads in part: "Fabergé has just brought your delightful egg for which I thank you a thousand times. The miniature group is marvelous and all the portraits are excellent". It was one of the Tsarina's few positive missives at this time to her husband. By now, almost totally under the influence of Rasputin, she was writing frantic letters to Nicholas, imploring him to dismiss one minister of state after another. Most time, Nicholas agreed and did so, but alexandra's advice was disastrous to the Tsar's and Russia's cause. Rumors were widespread that Rasputin was the Tsarina's lover, that she was in league with German spies and that she was betraying her adopted country. None were true. Within months the murdered Rasputin's body would be pulled from the frozen Neva, and the Tsarina would drift into a world of hazy sadness and resignation, a world her husband and children would largely share with her. The Steel Military Egg now has a polished, silvery look, rather than the original dull blackened steel finish. It is possible the finish of the Egg may have deteriorated during the years in storage in the Armory and that it was polished to stop further deterioration. 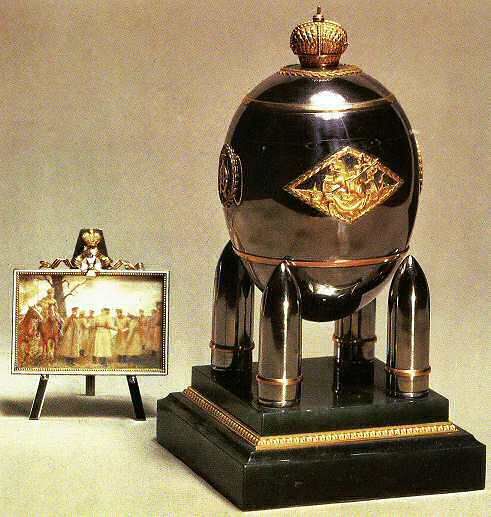 The Steel Military Egg was never sold and is one of the ten Imperial Easter Eggs in the Kremlin Armoury, Moscow.